Dr. William Nordt, MD, is a leader in the field of orthopedic surgery. He came to Enventys with an idea for a new and innovative line of dynamic braces that would better address the conditions that he saw most frequently amongst his patients. Dr. Nordt believed that a brace that was able to work with the body’s movement would be superior to other braces on the market in both fit and function. The Enventys team worked with Dr. Nordt on a new line of orthopedic braces that contained a knee, shoulder, carpal tunnel wrist and tennis elbow brace. The team of industrial designers and engineers leveraged their capabilities in insert and over-molding techniques to combine rigid and elastic members into a single, functioning component. The Reaction Knee Brace, the line’s flagship product, is a hinged knee brace that stabilizes the knee joint while dampening impacts and releasing energy to the user. The team designed an elastomeric web to absorb shock, disperse energy and shift pain away from the knee by taking the shape of the knee, leading to better fit and comfort. The brace is meant for everyday wear, and can be worn for anything from daily activities, to contact sports to water sports. It was designed to be lightweight for daily wear, and can be worn on either knee.. The Reaction Brace from DonJoy was launched at the 2010 American Academy of Orthopaedic Surgeons Annual Meeting. Its launch coincided with an update within the insurance coding that allows this brace to be prescribed and reimbursed by a patient’s insurance company, as well as available in retail locations. 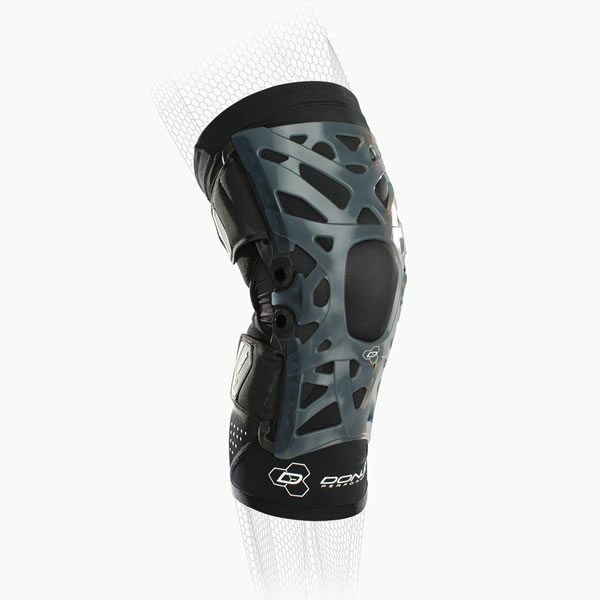 The Reaction Web technology used in the original knee brace was so innovative and well-received that it is now being used across other DonJoy product lines.